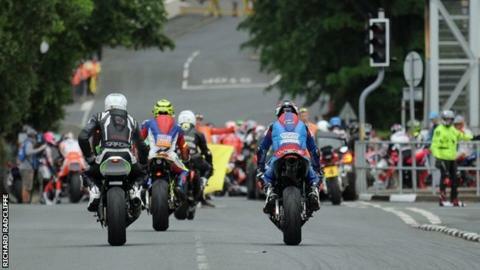 Most riders had completed only one lap when proceedings were brought to a halt on Wednesday. Saturday's opening Superbike race at the Isle of Man TT has been put back to Sunday after Thursday's scheduled practice session was cancelled. So far just one of five scheduled practice sessions has been completed after Wednesday's session was the latest to be affected by bad weather. The Superbike race will start on Sunday at 14:00 BST with Saturday's scheduled sidecar race to take place on Monday. There will be a full day of practice on Saturday from 10:40 to 17:00. Friday's practice session will be at the usual time of 18:20 while the opening Superstock race moves from Monday to Tuesday. Ian Hutchinson has posted the quickest lap so far this week at 128.987mph on his Tyco BMW.